Esther Bailey-Bass, a Certified Professional Co-Active Coach who regards herself as a Lifestyle | Leadership Coach specializing in personal leadership involving self-confidence, self-care, feminine power and authentic movement while engaging women to lead by example. In her words, "Leadership is an inside job. It is not enough to be authentic or unapologetic. There is a process for your growth and the journey of leadership starts with self-discovery." Trained through the Coaches Training Institute, one of the oldest coach training organizations in the world, she received her designation of Certified Professional Co-Active Coach (CPCC) in the spring of 2015. Esther is passionate about coaching, the ancient practice of Circle and using that work to connect and bridge understanding. As a veteran sales and marketing professional with more than 20 years experience in direct sales, retail and media sales, Esther fosters deep connections with clients building trust by modeling authenticity and transparency. A residual effect of coaching training is learning to ask powerful questions opening the windows of curiosity for deeper exploration. For Esther this enhances her work as a sales and marketing professional, too. Esther is a community activist utilizing coach training and circle process skills. She has served on the boards of CABLE, a non-profit leadership organization for women’s advancement, The YWCA of Nashville and Middle Tennessee and is currently serving on the board of the International Coach Federation (Middle Tennessee). She holds a Bachelor of Arts Degree in Business and Organizational Communication from the University of Akron. Esther can be reached by email at engage@ebbnflowcoaching.com or found on major social media platforms @ebbnflowcoach. The town center of Jodhpur, in the heart of Rajasthan, teems with the hustle of markets around the world. Spices are measured for sale in one corner with shoes in the next corner. 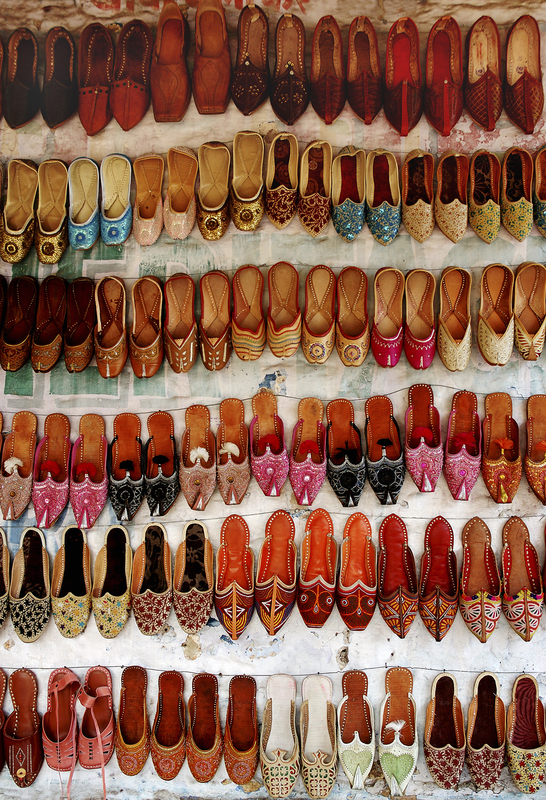 The traditional designs on these shoes are often hand stitched in local homes. The young man selling these shoes swore they were stitched by his own mother. Here, you can walk away wearing a little piece of the India of the maharajas. These shoes remind me of all the different shoes we wear & the diverse paths we walk each lifetime.